A new Switch and Crossing system, developed with the support of Ricardo’s rail engineering teams, will soon be in place to speed up track replacement work on the London Underground. 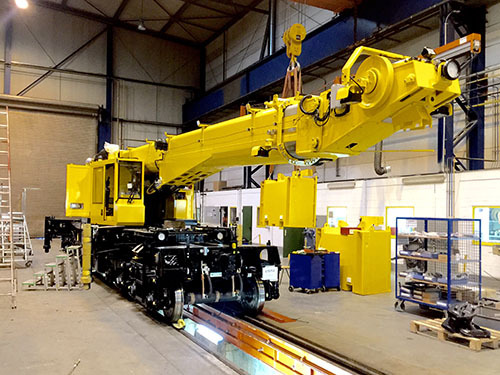 The system, developed and manufactured by Kirow, comprises of eight switch tilting wagons capable of carrying complete points and crossings panels to a works site, and two lightweight rail mounted ‘Multi TaskerKRC250’ cranes able to lift materials of up to 25 tonnes. Once operational, the system will be put to use on the Metropolitan, Circle and District Lines – known as the Sub Surface Lines (SSL) - and enable more work to be conducted within the strictly defined possession windows, reducing line closures and potential disruption to services. Although switch tilting wagons have operated on the UK main line for several years, they have never been an option for the tighter confines of the Underground network. However, Ricardo’s design teams worked with London Underground and Kirow to define the specific requirements and then introduced a number of design modifications - such as to the underframe and the spine of the switch tilting wagon – in order for the equipment to fit the reduced space of the SSL network. As the designs were developed, Ricardo’s teams also prepared the necessary engineering submissions to demonstrate compliance with both national standards, as well as with London Underground’s own technical specifications. The new systems are on schedule to enter into service in 2018, with the system currently being manufactured by Kirow.